Emboldened, perhaps, by the Turducken episode of last week, today I decided to venture into semi- uncharted waters and do the Expensive Seafood Thing at home. 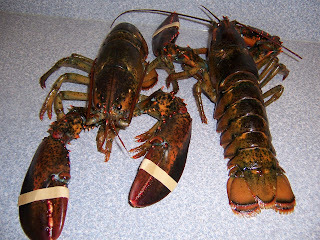 Now, I’ve steamed lobster in the past, so buying a pair of live lobsters was no big deal. 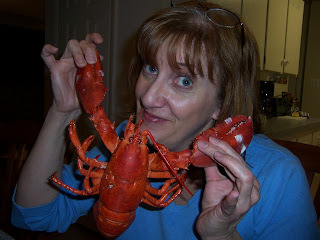 In fact, back when I was a struggling bachelorette living alone on a legal secretary’s salary, my big treat at the end of a typical exhausting, infuriating week was to buy a small lobster, a bottle of Grolsch ale and a baguette. I would steam the lobster and then devour it with butter, lemon, the ale and the bread. Looking back, I’m not sure if I was trying to pamper myself or, after five consecutive days in the poisonous atmosphere of my job, just wanted to kill something. Yesterday I was cleaning out a basket full of kitchen implements (an apple corer? an egg slicer? a gravy separator?) and discovered that, for some reason, I own an oyster knife. I don’t know how this could be; I’ve never opened an oyster in my life, but it’s just the sort of oddball thing my mother likes to stow in my Christmas stocking (like an apple corer, an egg slicer, etc.). Or I might have purchased one years ago on some kind of whim. At any rate, the discovery of the oyster knife, coupled with the recent knowledge that Wegman’s carries fresh oysters, sent me scurrying to Fairfax, where after consultation with the fellows at the seafood counter, I purchased two chicken lobsters (not cowardly crustaceans but lobsters that weigh about a pound) and a dozen Blue Point oysters. The lobsters were stowed in a paper bag and the oysters in a net bag that was in turn placed into a plastic sack left open so the poor suckers could breathe, and I took my ocean bounty home. I popped the net bag full of oysters right into the refrigerator but couldn’t resist playing with the lobsters for a bit. 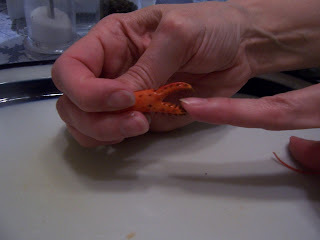 Their claws were banded so there was no danger of being pinched, so I gave them a quick promenade on the kitchen counter. They were pretty lively. Then I stuffed them into a large metal bowl, draped a damp towel over them and put them into the fridge as well. While the appetizer and main course languished in the icebox, I threw together a lemon cheesecake and then headed for the computer to Google “opening oysters.” I found all manner of information, including a nice video from the good folks at Epicurious which had useful step-by-step instructions. Feeling both knowledgeable and brave, at about a quarter of six I went back into the kitchen to start prepping. First I dumped all the ice in the icemaker into a plastic bag and crushed it with my meat hammer (so useful in the previous Turducken episode). I spread that out on a platter. Then I got out the oysters, dumped them in the sink and gave them a good scrubbing to knock off any loose sand and dirt. Then, with my left hand protected by a mesh meat-cutting glove and a clean dishtowel at hand, I picked out a nice plump oyster. Did you know oysters have a top half and a bottom half? The bottom half is more cup-shaped, the better to hold the lovely briny juice inside. 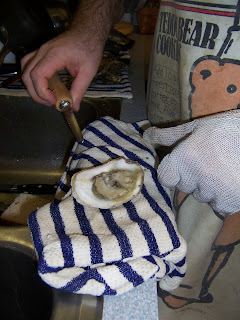 With the bottom half clasped in my gloved hand, I worked the oyster knife into the mollusk’s hinge. Not a great deal happened at first, but with the application of more pressure, the knife suddenly slid into the oyster, which spat a little juice. Rocking the knife back and forth, I worked the blade around the oyster’s lips and finally, the whole thing just came loose and I was able to lift the lid, so to speak. I used the knife to cut the abductor muscle inside, took a good whiff of the oyster’s innards (it smelled briny and fresh, not fishy), discarded the top shell and placed Oyster #1 on the prepared bed of crushed ice. I was struggling with Oyster #7 when John arrived home from work. #7 was the biggest of the bivalves and I was having some trouble with it, so John changed clothes and took over oyster duty while I prepped the lobsters. I filled a big stewpot with about two inches of water, put a steamer tray in the bottom, turned on the heat and gave the lobsters one last stroll. As John placed the last oyster on the ice, I popped the lobsters into the steaming pot and clapped on the lid. 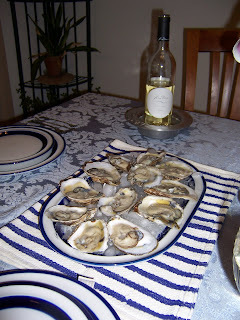 As the lobsters cooked, John and I started slurping oysters. I’d made a cocktail sauce which John dabbed on his selections; I prefer mine with just a squirt of lemon juice. We opened a bottle of Linden Vineyards Seyval, which has really nice citrus notes that complemented the fresh, briny taste of the oysters. They were really fine oysters, plump and sweet, and it was great fun tipping them down our willing throats. We finished them up in short order, then had just a short wait before the lobsters were finished. That’s the beautiful thing about seafood; it’s ready so darned fast. I’m calling PETA right now!!! How could you! !Just kidding! And that shark video looks like the Cheshire cat! He’s having FUN!Rachel Ray ya better watch out!! !